Oil is the raison d'etre of Surgut, the largest population center in the oil-rich Khanty-Mansiisk Autonomous Area. The city does offer other delights. Talk to an old person here and you quickly realize that this city of over 300,000 with its enormous malls, flashy foreign-designed architecture, good restaurants and decadent nightclubs was just a village when they went to school. The key factor in all of Surgut’s development has been oil. Surgut barely registered on population registers until the 1960s, yet is one of Siberia’s oldest settlements. Surgut was founded as an outpost in 1594 by Ivan the Terrible’s son Feodor I, the last Tsar in the Riurikid dynasty. Surgut was one of the Russia’s main Siberian outposts in the 17thand 18th centuries. From as early as the 17th century the city became a place of political exile and several of the Decembrists lived here in the 19th century. Revolution did not come easy to Surgut and it was an insurrectionary center of wealthy landowners against the Bolsheviks and the site of several peasant revolts. The settlement lost its status as a town and was for a while designated as a village, important at the time in terms of distribution of resources. Everything began to change for Surgut in the late 1950s when oil prospectors showed up. But, it wasn’t until March 21st, 1961 when Farman Salmanov, an Azerbaijani geologist, discovered a massive oil deposit nearby that Surgut really began its second life. The city’s population in 1959 was roughly 6,000. Today Surgut is a growing metropolis of approximately 332,000. The first logical place to make a visit is to “Stary Surgut” (Old Surgut), a recently reconstructed village designed to capture the atmosphere of the city before oil was discovered. Composed of 14 wooden homes this complex features museums dedicated to indigenous peoples, Cossacks and ecology, a reconstructed wooden church typical of the Russian North and several cafes. A museum to Salmanov hosts exhibits on the famed geologist, as well as the science of oil production in the actual building where Salmanov lived when he first came to Surgut in 1957. The grounds are restored to resemble the living conditions in 1960s Surgut. The Surgut Regional Museum features an outstanding collection on local history, including exhibits on Old Believers, political exiles and the revolutionary period displaying many uprooted Soviet-era statues. There is also a fascinating exhibit on Soviet childhood, featuring dozens of examples of children’s clothing and toys from the socialist era. The Surgut Fine Arts Museum features rotating exhibits on everything from folk costumes to icons to paintings. Both museums are housed in the same building. Oil tours are a nascent, but growing part of the tourist industry. Typically these tours include visits to major oil production facilities, where visitors will witness the oil-production process, learn about the history of the oil industry, climb an oil tower and pose for pictures in an oil worker’s costume. One company that can organize such tours, as well as dog-sledding trips is RusTurServis (rus.tur86@mail.ru, +7 (3462) 651-037 or 677-170). There is a closed museum to oil at Gazprom’s local headquarters, although visiting delegations and schoolchildren are often given entrance. Try your luck. A good illustration of the exhibits can be found here: dikiy-m.livejournal.com/54189. Russkinskaya is 130 kilometers north of the city through the tundra. One of the village’s main attractions is the Museum of Natural History, which features exhibits on local wildlife and the indigenous population. The best time of year to come is at the end of March when there is a festival celebrating hunters, fishermen and reindeer herders. 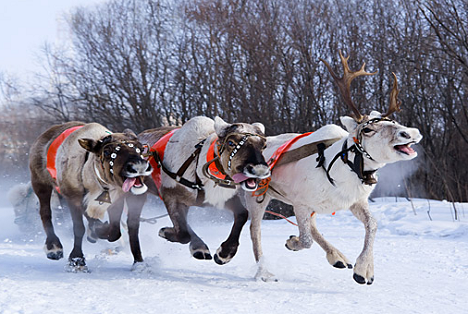 Reindeer riding and other activities abound at the festival. Lyantor is a picturesque Khanti village on the Pim River about 95 kilometers northwest with a museum and ethnic park featuring traditional Khanti habitats. Surgut is a wintry place, thus it should come as no surprise that locals love winter sports. Three places nearby for skiing and other cold weather pursuits are Olimpia, Snezhinka, and Kammeny Mys. Fish is the local delicacy with “muksun” being the most prominent. “Sterlyad” (sturgeon) and “nelma” (white salmon) are also popular. They can be purchased either smoked or raw. Indigenous peoples sell fish, reindeer meat, nuts and berries on the streets during winter. For the health conscious visitor try Vegen health food bar for breakfast, smoothies and live music on Sundays. “Sem Pyatnits” (Seven Fridays) is a good dinner option with a mix of Russian and European cuisine.